: WELL, ONE OF MY UNCLES IS A BIGG FAN, DRESS,SING,HAIR,VISIT GRACELAND ALL THE TIME, AND EVEN NAMED HIS SON ELVIS AARON. SO, BEING AROUND THAT WHEN I WAS YOUNG, GOT ME INTERESTED. : HIS LOOK,MOVES,ACTS,BEAUTY,AND THE FAMILY. "My Message to Elvis": IM IN LONE LOVE WITH YOUR DAUGHTER. I WISH I COULD SEE BOTH OF YOU SING TOGETHER. : LITTLE LESS CONVERSATION,POLK SALAD. MOVIE, GIRLS,GIRLS,GIRLS. : THE BEAT OF THE SONGS ARE AWESOME. I THINK HE LOOKS GREAT IN THIS MOVIE. : I WAS ONLY 5 THEN, I DONT KNOW. Thank you for taking part in our survey. 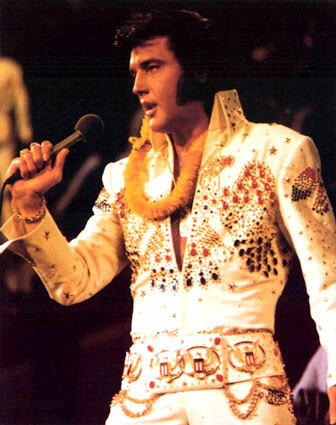 Elvis was a very handsome man, his looks, music, sense of humor and love for his fans were present in his concerts. His generosity to his family, friends and donations to others will always be a trade mark of his nature. Elvis was truly an amazing person, long live his memory.